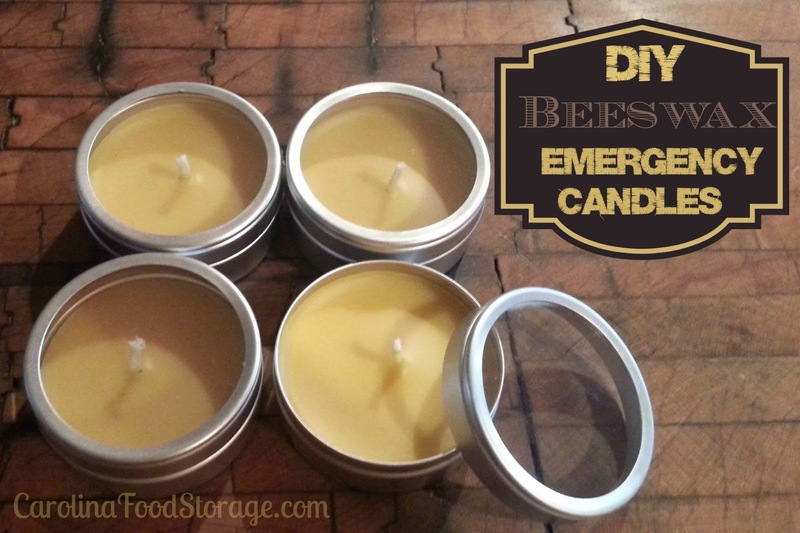 These mini emergency beeswax candles are a great addition to your emergency supply plan. I used these small metal containers that I found at my local craft store. They were only a few dollars on clearance and I can reuse them! The small size allows them to easily be added to a 72 hour kit or car emergency kit. Some people may wonder why you would want to have a candle in a 72 hour kit. I can tell you its not for a romantic candlelit dinner! When you find yourself needing to use your kit you may be without power in your home and need a light source or you may be stuck outside and need assistance building a fire. Either way these little candles will come in handy. Each one will burn for about 3 hours. 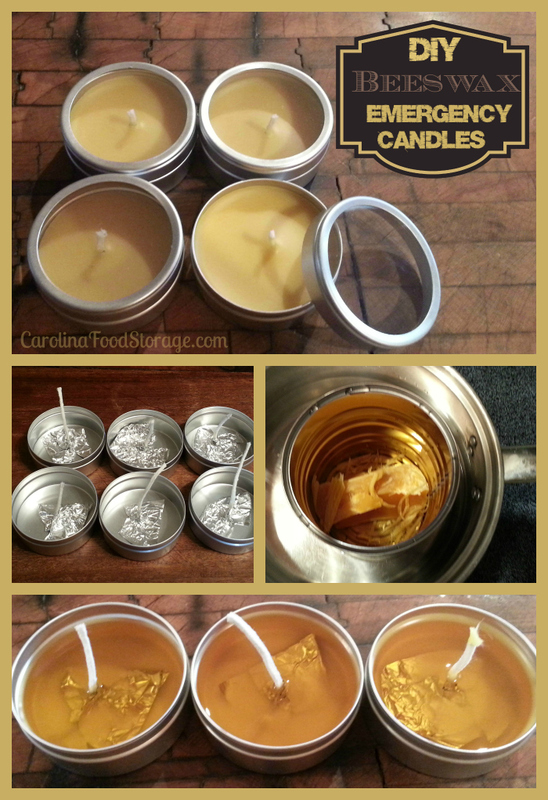 I chose beeswax to make my candles because they are all natural and burn cleaner than other waxes. They also have a great scent that isn’t overpowering. You can find beeswax blocks at your craft store or natural food stores. When melting the wax I chose to use an old THRIVE can that I had instead of messing up one of my good pots. This worked well and I threw the can out after I was done making the candles. When I made this batch, I didnt have any wick bases so I improvised using tinfoil. I wrapped about an 1/8″ of the wick in foil and then pinched it tight and formed a little base. It actually worked quite well especially since I had wick on a roll. 1. Prepare your candle containers and wicks and lay them out on a protected surface. You will want to leave the wick a little over the edge of your container. You will trim it later. 2. Add about 2″-3″ of water into a medium pot. 3. Break off medium sized chunks of beeswax from your block and place them in an old can. You could also use a double boiler to melt your wax. 4. Slowly melt the was over medium heat. Do not over boil the wax. 5. Once wax is melted use an oven mitt to remove the container from the water and slowly fill each of your candle tins. Leave just a little space from the top of your container. 6. Allow candles to dry for a few hours and then trim the wick.